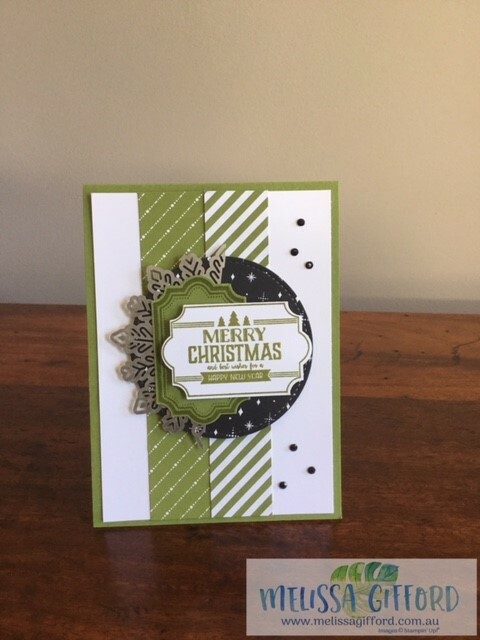 Melissa Gifford - Independent Stampin' Up!® Demonstrator: Merry Christmas! I wanted to share with you the Christmas cards I made this year. I was really drawn to the Merry Little Christmas Suite when I first saw the 2017 Holiday CAtalogue. I loved the simplicity of the old olive, basic black and whisper white colours and also the tags and co-ordinating punch. Whilst I was waiting for my order to arrive I saw a card made by Erica Cerwin and that got my creative juices flowing!! I mixed up the designer series paper strips and the sentiment. I just love those foil snowflakes too and being able to cut them in half made it more economical too when I needed to mass produce my cards!